It’s been less than a decade since the first iPhones (s aapl) hit the market, but most can hardly remember a time without them. In 2012, the average user downloaded 80 apps per device. This is eight times more than in 2008 when there were only 10 apps downloaded for every one device. There have been a lot of studies on the number of apps downloaded – remember the 50 billionth app download winner last May? – but what do we really know about the breakdown of the App Store? What could the 50th billion app download winner buy with that $10,000 iTunes gift card? That’s exactly what I wanted to uncover. These numbers aren’t as easy to come by as one might assume. If you check the App Store, you won’t find a shopping cart you can fill up to get these numbers, nor can you get them from market research firms that charge for Apple stats. Getting this information requires a lot of digging, that’s what I get paid to do as a researcher at an enterprise mobile security startup. So how many apps are there in the App Store? More than 760,000 – a staggering number when you consider that it launched with roughly 50,000 apps just under six years ago. Even more staggering is the total price if you add up every app in the store – $1.13 million! Now that we’ve defined the full scope, let’s take a look at how the numbers break down. What categories are the most popular with developers, and how much are users spending to download apps in those categories? The figure below breaks down the details across the 22 different categories that Apple tracks. There is a 23rd category for ‘newstand’ apps, but these are actually treated as content more than applications, and as such are not included in this research. It is worth noting that even though in the App Store an app can be listed under multiple categories, this classification is tied to the primary category the app developer registers with Apple. By using this metric, we won’t count any apps twice. What you can see from this chart is that the most expensive apps based upon an average per paid app can be found in the Medical and Business categories respectively. 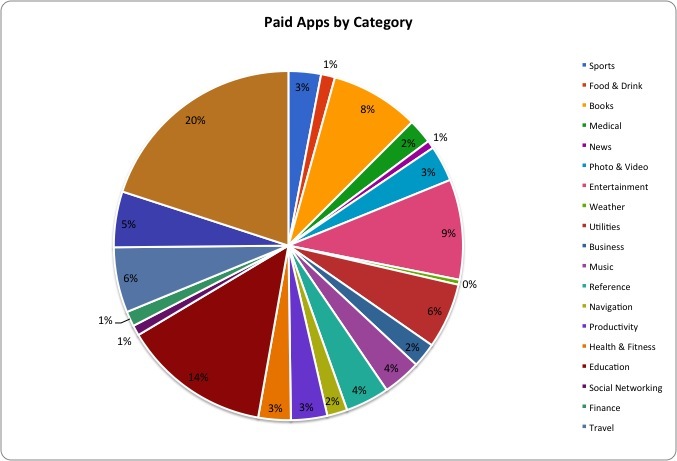 However, being the categories with the highest average price for apps does not directly correlate to revenue. In fact, “Games” (which by the way accounts for 60,000 of those 760,000 apps) has the cheapest apps, but generates the most revenue of any category according to the App Annie Index. 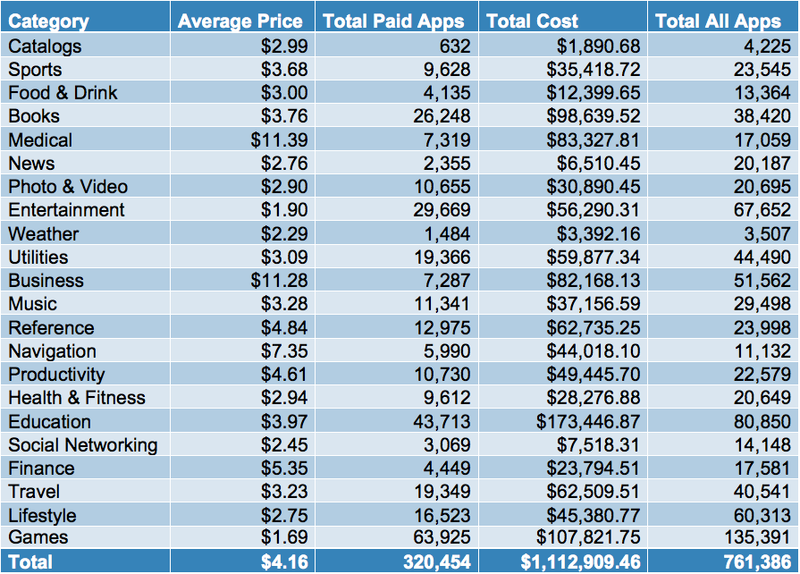 At just $1.69 per game, the average costs of apps in the games category is the lowest of all 22 categories. This does not take into account the free games (which would significantly reduce the average cost). I have included a few other charts to help you visualize the story. 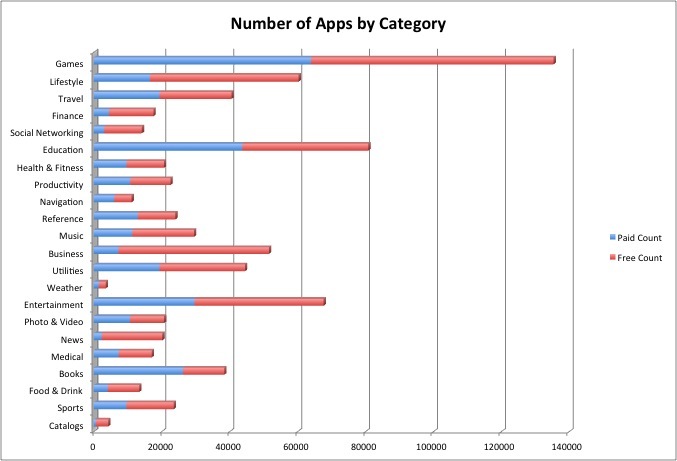 What you can see is an incredibly vibrant ecosystem where five of the categories have over 50,000 apps; in effect providing more diversity in each category than what was there when Apple launched the App Store. While the cost to buy all the apps in the App Store is $1,112,909, this only accounts for “paid apps” or 320,454 of the 761,386 available as of May 2013. This means that if each of those free apps cost just $1, the total cost of buying out the App Store would be significantly ($440,932) higher. In terms of the cost of the App Store it is concentrated heavily in six specific genres: Education, Games, Books, Medical, Business and Reference. These six genres account for over half the cost of the App Store (see below). This data compiled here gives us a window into the “app” ecosystem. From a security perspective this data shows what corporate IT departments are up against as employees bring their own devices to work. It would be a near impossibility for an organization to manage a blacklist linked to this onslaught of applications. Just as it would be a pretty near impossibility for someone to buy every app in the app store. Eric Monti is a researcher at Bluebox Security. This analysis is good as far as it goes but doesn’t account for “in-app” revenue from free downloads. Free downloads are ~10x more common than paid downloads but many generate revenue from the app itself. Number got me drunk! But still very interesting to know. Those numbers got me drunk! Still interesting though. We are in the era of Smart Phones in the hands of Stupid People!!! wow…so much in the “education” department, who would have thought!